This has been an "interesting" year. We started out real strong, finishing 2nd at Dansville, after analyzing the track I decided I needed to take some weight off the front, which provide to be a good decision. We then went to Canandaigua, what a nice pull that was for a first year, nice level pits, and pits were close to the track. Rockefeller Agency had a hospitality tent there that worked out very well. I got a lot of positive feed back and it sounded like everyone had a great time. I was first hook, my first run the tractor wanted to go out of bounds to the left really hard, as a lot of tractors did in the class. I was able to hold the tractor in bounds by some very hard use of the brakes and just got it out. Sharon Everman also got a full pull. When I came back for the pull off, I made some adjustments to compensate; I did not have any problem with the boundary line. As a result I went 318 feet, almost 18 ft further than my first hook. Sharon was not able to come back for the pull off. At the end of the pull off run, I found I had broken a motor. On disassembly of the right front motor found that a piston had broken. There were a lot of broken parts inside. On to Morilla, the rain became an issue, first we were pulling, then we weren't, then were weren't and then it down poured as the mod class was going out on the track for their class and we all got soaked, then went home. Next pull was Alexander, the first night we did not finish so well, the 2nd night we won for our 2nd win of the year. We were on a roll! I went 297ft 9", and then I remembered the $1,000 bonus to the winner only applied to a full pull. From there we went on to Penn Yan, after the first class we got a big rain. The track was covered but since it runs down hill, the rain ran under the plastic. Note for next year; ditch the upper end of the track at the beginning of the plastic. The track crew did a good job of "saving" the track, the scraped it off with a bull dozer. The class was then started less the top 8" of the track. After watching Fintak brothers get totally out of shape and it appeared there was not much grip on the track. I made the necessary adjustments and made an acceptable run under the circumstances and finished 2nd to Ferry brothers by 9". Next stop was Troy, both Fintak's and I got a full pull. I blew a lot of oil out of the left motor and the oil pressure light came on. When Dale asked me if I was coming back for a pull off, I told him yes, knowing I could only run 2 motors. In the pull off, Fintak's made a good run. I had told the officials I would make a run, consequently I did with 2 motors knowing I did not have a chance at winning, Fintak's went 303 I went 268. We had another 2nd, the point’s race was going well, and at that point I believe our lead was 15 or 18 points over Sharon, and more over Fintak's & Durfee. The next stop was Fergus Ontario and we got to see how the Tech officials could effect and change the end of season points. The first night Thumper II made a nice run of approximately 280 ft, I hooked 2nd and went approximately 290. When I stopped I noticed the right motor had huge amounts of liquid coming out of the pipes. At first I thought it was a burnt piston, but since it was all the cylinders I was not sure what the issue was. I also knew I had some kind of problem with a clutch, as I could not easily shift gears and back up to the sled to un hook. I then was towed back to the trailer. I noticed it had been a long time with out hearing the next tractor going down the track. I then heard the announcer ask me to come back to the starting line. When I got back to the track I found they were having a meeting, seems that the next tractor had not updated their tractor per the rules! It basically boiled down to a couple years ago the sleds went to a larger chain, which necessitated a bigger hook for the chain. As a result the rule came out that the hole in the draw bar had to be enlarged from 3" round to 3x3.5". It seems that 3 of the tractors had not followed the rules and changed the hole in their hitch. 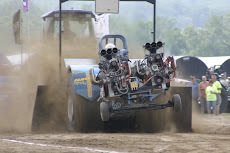 Their is no allowance in the rule book for changing the rules because some tractors do not meet the rule book. But, in this case the tech officials decided they should change sleds and restart the class, because those tractors would not be able to hook, rather than get a torch out and cut out the draw bars as they did for the next class of SS. So the decision was to sacrifice one tractor so they could gain 2 tractors and punish the legal tractors! There was not enough time to research and correct the problems. When I got back to the track, I found that the large tow tractor and dragged my tractor back to the track with the left brake locked and burnt up the brake pads! The rear motor starts with a starter and starts the other two, for the first time in 14 years the starter would not start the motor so I had to tow start the tractor. I came out of the hole very well, but as I was going down the track I could tell the mechanical issues were not good. I did not feel that breaking $10,000 or more parts was the smart thing to do, so I shut down at 200 ft and finished 6th. I found that the barrel valve arm had come off the right motor consequently the motor was getting all the fuel available. The left motor the clutch can bearing had come loose allowing the out put shaft to slide back and drop off clutch plates from the front. I had also pushed out the intake manifold gasket. As a result the clutch would not lock up. I would not have been able to correct these problems with the limited time between the re-hook! Ben Clark and Al VanOstrand worked with me a lot of the night to correct the problems & again the next morning. When we went to hook the 2nd night hook, the tractor bounced very badly, as a result of burning up the clutches on the 2nd run the day before! So returning from Fergus we had gone from an 18 point lead to a 3 way tie with Sharon & Fintak's. I adjusted the 2 front clutches, and found they had worn excessively as a result of the 2nd hook at Fergus the first night. Next pull was a 2 hook pull at Langford. The first hook the tractor did not seem to go well; it seemed tire speed was not what I expected. We came back in the evening, I made some adjustments for the track, and had what felt like a good run, the tractor was pulling to the side line, I had brought it back with the brake when at about 200 ft I thought I heard engine RPM pick up I shut down before hurting anything. The sled slid around behind the tractor, and it looked worse than it actually was. My friend Wayne Longnecker had accepted my invitation to come from Iowa with his Griffin Powered tractor, it was great to see him. He made some nice runs and the Griffin is impressive. We came home and pulled things a part looking for problems with out success, maybe I was just imagining that I heard an engines RPM go up. BUT, the fact was still there, the boost pressure had gone up high, or at least that is what the gauge told me. TWD when the mods got to it. Wayne was first hook, he did not run a high enough gear to load his engine, and as a result he made an exciting fire show from his headers. He shut down and dropped. The tractors in front of me all ran right down the center and bounced bad. I lined up the sled to the right side line. When I came off the line the tractor hooked up good, again about 200 ft the rear motor broke up, so I shut it down. When I got back to the trailer, I found that the boost gauge showed an unusually high reading again and the crank blower pulley had sheared off all the bolts. I did not have time to find the problem and get it fixed to go to Pike; since it rained at Pike I lost the hook points. When I got home I started to disassemble the top motor, looking for anything that might give me an idea of what was going on, ignition, clutch, fly wheel, gear box! I think I have finally found it, something changed with the clutch on Friday night in Fergus when I had to make that second run, either the other clutches not locking up, or tow starting the tractor, but the throw out bearing is hitting the clutch forks at the cross shaft. Everything is fine until a big load gets on the clutch, and the RPM’s are up. Then the clutch slips, I am shutting it down quick enough that it is not burning up the clutch. I had adjusted the clutch pack so it was tight. So I pulled out the cross shaft and fingers for the rest of the year and I will try to figure out what happened this winter. So we went into Fergus leading by 18 points, and because of a “re-looks” we are lost 67 points to the current leader and are 49 points out of the lead!